He looks a bit devious. Are you sure you can trust him? He does come at me out of nowhere sometimes! We found him by the road a few weeks ago with part of his ear bitten off. He was dehydrated and very small. He’s very happy now after some care and attention. OMG, you made my day. You old softie, you! You gave that cutie an HEA. I bet the “Sparks” you have love him! They are very curious so we are taking the process slowly. This little assistant is still very small for them. Ain’t the truth. 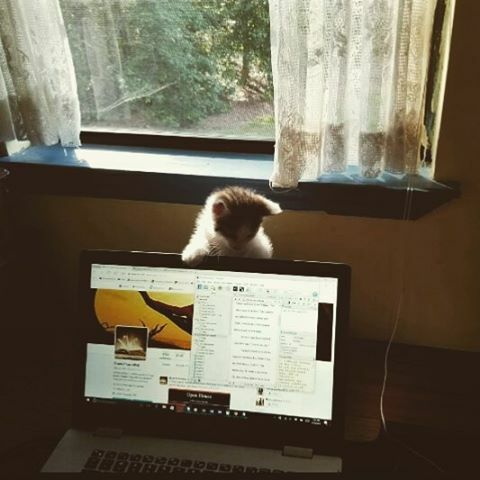 He’s starting to get way too curious for his own good. With my touchscreen and can mess something up easily! He’s a complete mess. We have a couch with a roll-away in it and he found a way to scurry into the back of it the other night like quicksilver. He got wound up and was gone in a blink. Gotta get some video of him running around. He’s so small it’s hilarious to watch him! I ran a cute photo out today. Looking forward to the video. bookmarkeԀ! !, I really liҝe your blog!